One of the first things I was exposed to when I arrived in Paris was the amazing chocolate shops. It was Easter weekend and many of them had their Easter chocolate sculptures on display. I had never seen such amazing looking chocolate sculptures in all my life! They were all different shades of colors as if they had each been hand painted (perhaps that is the case, who knows)! I decided that I could not leave Paris without taking advantage of the timing and buy my own chocolate sculpture and was trying to decide which shop to buy one from. La Maison du Chocolate was a chocolate store that came highly recommended from my “Edible Adventures in Paris” guidebook along with my newly acquired “Le Cordon Bleu – Welcome to Paris!” booklet. 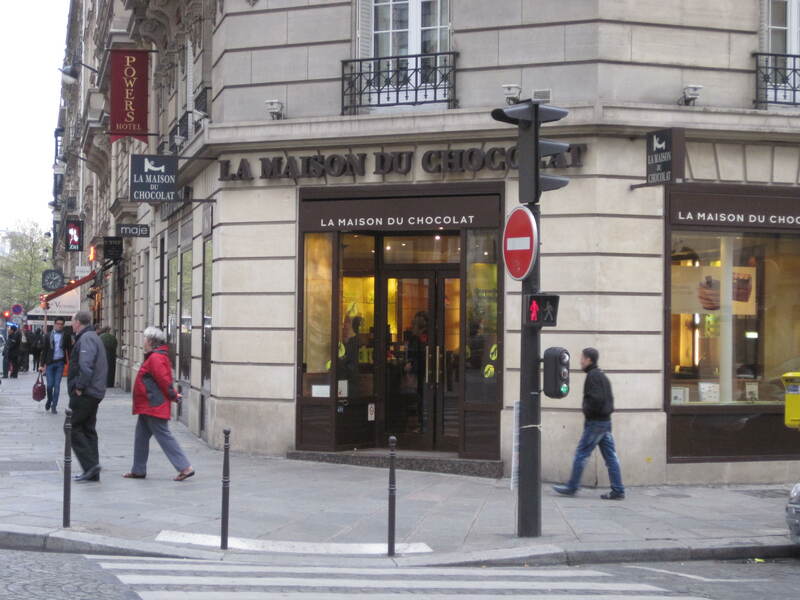 That afternoon, I set out to find La Maison du Chocolat. 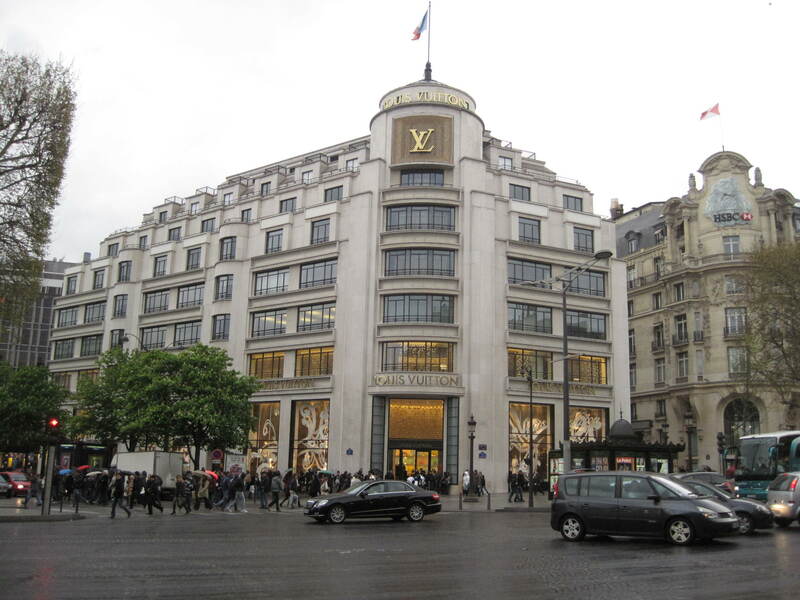 One of their main stores was located in the high-end shopping district, just a stones throw away from the Champs-Élysées and the Arc de Triomphe. I figured I would make a trip out of it. 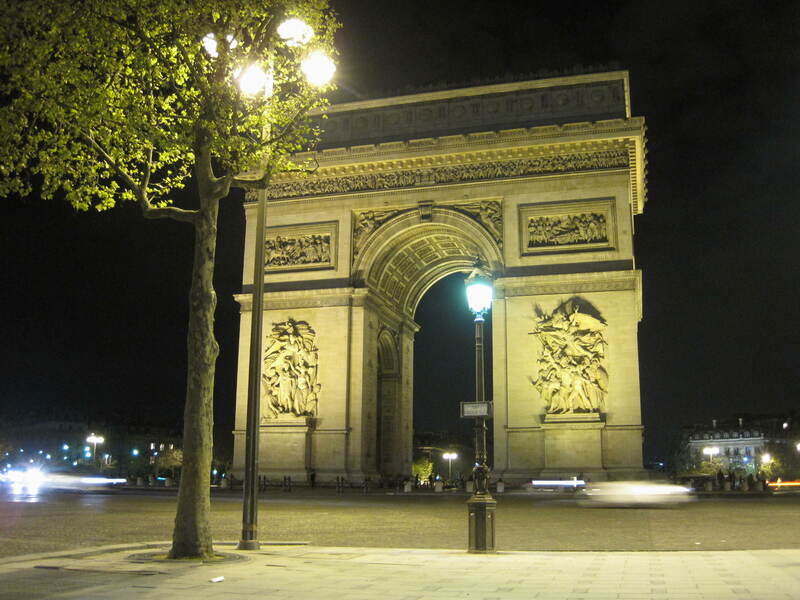 Wow, the Champs-Élysées is what I call BIG Paris! Kinda like Fifth Avenue in New York City where there are huge avenues, lots of traffic, huge sidewalks full of people and high-end designer flagship stores with the Louis Vuitton flagship store taking up a very prominent corner. I arrived at le Maison du Chocolate and was actually intimidated to go in at first! It felt like I was walking into a high-end jewellery store with gorgeous sales associates behind the counters handling chocolates with special metal clamps so as not to melt them and placing them in distinguished gift boxes tied with ribbon. There were signs in french next to each of the chocolates but I was missing certain words in translation and when it comes to fancy chocolate, I don’t like to take chances. I asked the sales associate “Est-ce que vous parlez anglais?”, His reply – “Oui”. Yay! What a relief! I said that I would like to get some chocolate but I wasn’t sure what all the different types were. The sales associate patiently walked me through each chocolate and explained what was in each one (there were at least 15 different kinds). I must say, the service that I have experienced in Paris so far has just been fabulous! I chose 5 chocolates to take home (mint, passionfruit, caramel mousse in dark and milk chocolate and a salty praline). He wrapped them up and then asked me “Would you like to try one?” (this seemed to be standard practice – people often get a sample of chocolate whenever they buy something). How nice! He recommended I try Dentelle – a milk chocolate praline which had slivers of crispy biscuit/waffle inside. He said it was a new flavour and that lots of people had liked it. I bit into it…..oh my goodness, it was amazing! It had the texture similar to a KitKat bar but the crispy texture was a lot more fine and delicate and the chocolate was AMAZING! I will definitely get that next time! The chocolates were surprisingly affordable! When they rang up my order, the bill only came out to 5,50 euro for 5 chocolates (or around $1.50 Cdn each). They sell the chocolate by grams. However, when you purchase them in a box, the price goes up quite a bit (they smallest size box will fit around 21 euros worth of chocolate). But if you just want to try a couple at a time (like me), you can buy 4 or 5 pieces and they put them in a small bag and the price is very reasonable.